Looking for a vinyl flooring product that offers the best of form and function at a competitive price? You can shop with us in three different ways. Drop by our showroom, go online to view thousands of affordable styles, or have our team bring the samples right to your home! You can experience the texture and color of each flooring product for yourself. Many homeowners are discovering the dynamic properties of vinyl flooring. Thanks to our results-driven manufacturing partners, we are able to offer products made with the latest in technology. This means that any product you purchase through our store features stronger, scratch-resistant, and more durable vinyl flooring options for your upcoming project. Vinyl tile flooring in particular is a popular choice for kitchens, bathrooms, and other rooms that frequently see spills and water messes. Because it mimics the appearance of traditional tile, but consists of several water-repelling vinyl layers, it offers busy families a luxurious walkway with the added benefit of easy cleaning. Our team can use the product of your choice to create stylish patterns, including classic checkerboards. Compared to most flooring products, vinyl sheet flooring is relatively inexpensive and subtle in appearance. This product is backed with fiberglass, which makes it sturdy and able to stand up to the test of time. You and your family will have a hard time scratching or otherwise damaging this durable flooring choice. Though it is long-lasting, it is also soft. You will love the cushiony feeling of walking over it in the morning. Opt for this flooring when you are ready for a low-maintenance, yet stylish flooring option that won't buckle when it comes to lots of foot traffic and spills. Our specialists recommend this product for almost every family; thanks to its unique consistency, it is the perfect choice for those that value simplicity and comfort. If you have always wanted hardwood floors, but do not have the time or money to maintain them, vinyl plank flooring may be the perfect solution. This recently popular flooring product imitates the appearance of real wood floors closely - you'll even notice the wood grain and knots that you'd see in real trees. However, unlike hardwood flooring, this product is hard to damage and resists most scratches and dings. Additionally, while true hardwood flooring needs refinishing every so often to keep it handsome, these floors do not fade or wear away. Cleaning them with a mop or broom is easy, as they are waterproof and resist stains. Though it looks like real wood, it won't warp when exposed to moisture. It's the perfect sophisticated option for families concerned about messes caused by children and pets. Once you've chosen the perfect vinyl flooring product, ensure you get the most out of your investment by scheduling installation with professionals. Choose our experienced flooring technicians to install your latest purchase and discover the difference years of experience can make in your project. We have the tools and equipment needed to install any vinyl flooring product the right way. Though our flooring specialists are confident in their ability to install your new purchase, we're committed to your satisfaction. If you notice a problem related to vinyl flooring installation after we've finished our work, just let us know. We will visit your home to fix it, free of charge, so that you can get back to enjoying your home's latest feature. Additionally, if you don't love your new flooring after living with it, let us know. Within 30 days of installation, we'll replace it, free. You and your loved ones can rely on our flooring team's years of experience when it comes to purchasing and installing new products. Our team prioritizes your family's preferences during the shopping process. That's why we're always prepared to show you the benefits of each vinyl flooring variety available. 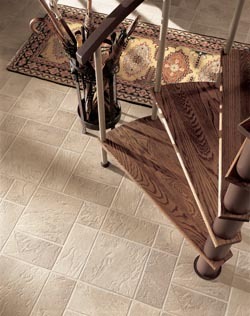 Be sure to schedule vinyl flooring installation with our professionals for even more high-end customer service. Talk to a member of our staff to schedule a free consultation, during which we'll discuss your needs and your budget. Depending on your lifestyle, one of the vinyl products may be more appropriate than another for your project. Our professionals can help you evaluate the benefits of each of our products, enabling you to make a smart choice for your home and your finances. We also offer approachable financing options for homeowners that need some assistance in funding their new floors. Our team understands that adding a new feature to your home can put a financial burden on your family. That's why we partner with Synchrony Bank, one of the largest nationally trusted financing authorities in the country. Apply online to learn how they can help you. Ask how you can receive up to $100 off your next flooring purchase. Our store is always looking for new ways to help our clients save on essential flooring products. That's why we're excited to offer this exclusive coupon to homeowners shopping for a high-end flooring upgrade. Get in touch with a team member to learn more about this exciting offer, or go online to fill out our form. Contact our shop to schedule a vinyl flooring viewing at your home, or visit us to view samples at our showroom. We proudly serve the communities of Fairfax, Fairfax Station, Falls Church, Centreville, and Gainesville, VA, plus all of the surrounding areas.